Porsche, it’s not just a name, but what it stands for. Sports cars. Porsche is the story of success, starting with the life’s work of two visionary engineers: Professor Ferdinand Porsche and his son Ferry. 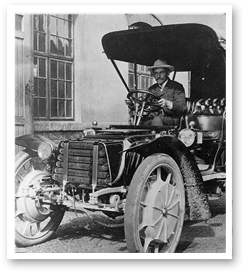 Before starting his own office, Ferdinand Porsche worked on many projects where he exposed his pioneering technologies, including the all 4wheel drive and four-wheel brakes Lohner-Porsche Mixte from 1901, creating the world’s first functional hybrid. The company started making his mark on the history of the automobile when on April 25th 1931 an independent design office was started at Kulmenstrasse 24 in Stuttgart. On January 17th 1934 was, a draft outline was submitted to the German Reich’s Ministry of transport that entitled: “expose on the construction of a German people’s car”. Soon after this he was given an order to design an build the first prototypes of the Porsche type 60, which were assembled in the garage of Porsche’s villa in Stuttgart, starting in 1935. In 1938 Porsche moved to Zuffenhausen to design and construct amongst other projects the Porsche type 64, the Berlin-Rom car, which definitely hinted at the genes of later Porsche sports cars. The streamlined racing coupe was expected to provide favourable publicity for the Volkswagen. The Berlin Rom race was scheduled for September 1939, however the race was cancelled because the war broke out. During the war in 1944, Porsche moved to Gmund and the company struggled for survival when the war came to an end. Nevertheless, it was the Type 64 project that inspired Porsche to build its first Porsche after the war. In 1947 Ferry Porsche began to give serious thoughts to building a sport scar based on Volkswagen components, however with its own load-bearing chassis. The successful story of Dr. Ing. h.c. F. Porsche AG, Stuttgart, as the Company stands today, would be inconceivable without the lifetime achievement of Ferry Porsche. On July 17th 1947, work began in Gmund on the first sports car to bear the Porsche name, based on the design of the type 64. According to Porsche; “At the beginning I looked around, but I could not find the car I was dreaming of. So I decided to build it myself.” It had to be a car that was fast, light and small. Eventually a new model was conceived bearing the internal design code of “type 356”. It had a tube steel frame, with the suspension largely derived from the Volkswagen and an aluminium sheet body shaped by hand over wooden formers that was mounted on this chassis. The air-cooled 1131cc flat 4 engine was also taken from the car we now know as the Beetle. 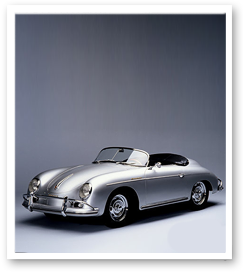 Production of coupe and cabriolet of the 356 got on their way at the second half of 1948. Porsche exhibited its first production cars at the Geneva Motor show in the spring of 1949. License fees from the Volkswagen Beetle generated the development of the 356. In 1950, Porsche left Austria and returned to Zuffenhausen, in order to have a larger production facility. 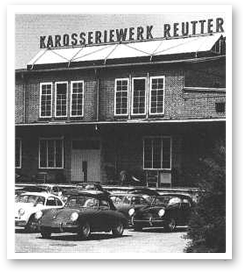 Porsche rented the first floor of Karrosseriewerke Reutter, which also began producing the bodies for the 356 from steel in March 1950, with the first production target of 100 units each year. The first type 356 had a windscreen out of two pieces, which was replaced by a single bend screen in 1952. The engines were four cilinder boxer engine configurations with varying displacements: 1.086; 1.268; 1.290 or 1.488 cc with power output ranging from 40 BHP to 60 BHP. The number of Porsche owners increased rapidly, however in the early post-war years the market in Europe was still limited in volume. Export to the USA was the only way to expand the business. A decisive meeting took place in 1950 at the Paris Motor show, between Porsche and American dealer Hoffmann. In order to establish itself, motor sport proved to be the most successful medium. “Win on Sunday, sell on Monday” was the best way to tempt potential buyers to the showroom. 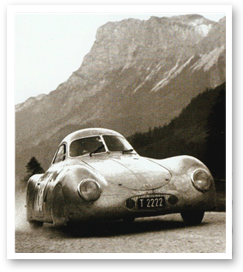 The 356 was very popular on racing circuits and rallies. When an 356 won the Mexican Carrera Panamericana, Porsche decided to build a superfast version under the name “Carrera”. This version had twin camshafts and could reach above 6.000 rpm. The engine output was around 100 BHP. With a variety of wins across many racing events, Porsches sales figures confirmed the success of this approach. By 1955 half of the total output was being sold in the USA. In the five years since 1950 the numbers of Porsche 356’s sold went up from 369 to 3624 cars a year. The Porsche 356 had become a cult car. 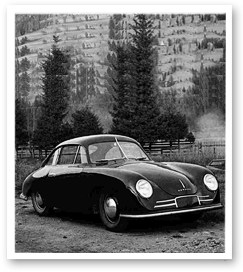 Only ten years after the first 356 had premiered, the plant in Zuffenhausen had built more than 25000 sports cars. In 1959 the Porsche 356A was replaced by the 356B. This model had different bumpers and headlights as well as some interior changes. Next to the 356B, a ‘Super-90’ model became available with a 90BHP engine and upgraded rear suspension, while the Speedster was called Roadster from that time on. The 356B also became available as a Carrera version. In this trim the 1.966cc engine produced an astounding 130 and even 155 BHP in some cars, with disc brakes at all four wheels as standard. The last versions of the 356 came to market in 1963: the 356C. Disc brakes were now standard and the power output of the 1.582cc engine were available in 75 BHP and the 95BHP SC version. After two years the production of the 356 comes to an end: the successor in the form of the 911 was ready to enter the market in 1965. By the early 60’s Porsche became aware that the potential of a sports car needed a boost. Only a major leap forward in technology and styling would maintain the brands leading position. 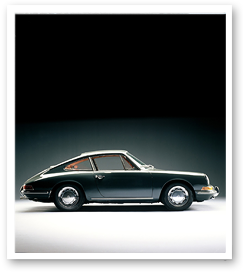 In September 1963 a prototype of the meanwhile legendary Porsche 911 was revealed at the Auto salon Frankfurt. Porsche intended to call this car the 901 but changed it to 911, since Peugeot had already successfully claimed a patent on model names with a 0 in the middle. The design of the 911 came from Ferdinand Alexander ‘Butzi’ Porsche, the oldest son of Ferry Porsche. The front design of the 911 was already applied to another model that did not reach production. Luckily, for the 911, this iconic design was accepted. The Porsche 911 was not only extraordinary because of its classic and unique design, but also because of its leading technology. Much of the ideas that found its way to the 911 were born on the racetrack. As an example, the engine of the 901 was a detuned version of Porsche’s 8 cylinder racing engine. This boxer engine was positioned in the back, just like the 356 and was also air-cooled. In September 1965 Porsche introduced the 911 Targa, a version with detachable roof panel. The original displacement of the 911/901 was a 1.991 cc 6-cylinder boxer engine producing 130 BHP and only by 1967 versions with more power became available. Despite the classic looks of the 911, many customers found the 911 too expensive. Porsche reacted to this shifting demand by introducing the 912: a version with the 1.582 cc 4-cylinder boxer engine from Porsche 356 Super 90, producing a healthy 90 BHP. By the way, in 1967 the 911 also became available with a sportomatic semi-automatic transmission, which required no clutching. Although very modern, the system was not very reliable and therefore only a handful of 911’s were delivered with this option. 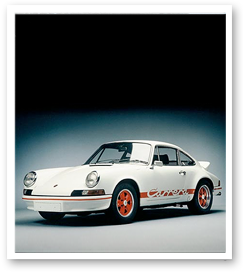 In 1972, Porsche introduced its top model: the fast 911 Carrera RS 2.7. Considering its looks the RS (what stands for Renn Sport) was easily recognisable with its distinctive “ducktail” (that increases down force at high speeds) and the wild inscriptions “Carrera” on both sides of the car. The most important part however, was the increased displacement of the 2700cc 6-cylinder boxer engine. Thanks to a mechanical injection system from Bosch the engine produced a stunning 210 BHP. This particular air-cooled engine closely resembles the famous engines that Porsche used with its racing activities. With the 911, Porsche had designed and created a truly timeless car. What they did not know at the time is that the 901/911 design formed the basis of years of evolution of the proven design, which was only changed more drastically with the development of the 911/993 that came to market in 1993. Also the air-cooled engines have followed the same evolutionary path. 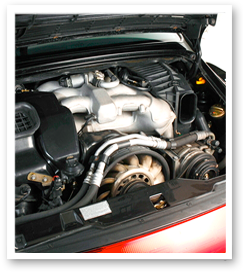 Only with the appearance of the 996 model in 1998, the air-cooled system was abandoned in favour of a water-cooled engine due to emission regulations. 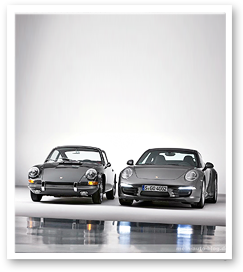 The evolution started with the 2-liter 911 from 1963 – 1969, the 2.2-liter 911 from 1970 – 1971, the 2.4-liter 911 from the years 1972 – 1973 (the Ölklappe model), the 2.7-liter 911 from 1974 – 1977, the 3.3-liter 911 Turbo from 1975 – 1993, the 911 SC from 1978 – 1983, the 911 Carrera 3.2 from 1984 – 1989, the 911/964 Carrera 4 en 2 from 1989 – 1993 and finally the 911/993 Carrera from 1993 till 1998.